Mizzou Botanic Garden invites you to kickoNational Pollinator Week with a Native Pollinators Dinner! National Pollinator Week is the week we highlight and share the importance of pollinators including bees, birds, butterflies and bats. 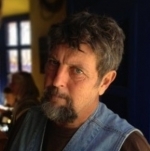 Gary Nabhan is an Agricultural Ecologist, Ethnobotanist and Writer at the University of Arizona. National Pollinator Week is a time to celebrate pollinators and spread the word about what you can do to protect them. Seattle’s 2016 Pollinator Week keynote address, by Gary Paul Nabhan, Ph.D. (Ethnobiology for the Future, The Forgotten Pollinators), offers a broad-ranging and visionary perspective on bringing food biodiversity back into the city. Agricultural historian Peter Hatch of Monticello has called Nabhan “the lyrical scholar of genetic diversity.” He has been been named as a pioneer and creative force in the “local food movement” and seed saving community by Utne Reader, Mother Earth News, New York Times, Bioneers and TIME Magazine. Nabhan is the recipient of many honors, including a MacArthur “Genius” award, a Lannan Literary Fellowship, a Southwest Book Award, the John Burroughs Medal for nature writing, the Vavilov Medal, as well as several honorary degrees and lifetime achievement awards. Local poet Jourdan Imani Keith will open the evening with a poem. The Merwin Conservancy presents local food movement and celebrated nature writer Gary Paul Nabhan in The Green Room, on Saturday, Aug. 27, 2016 at the Maui Arts & Cultural Center’s McCoy Studio Theater. The event begins at 7 p.m. The event is being held in conjunction with the Indigenous Crop Biodiversity Festival and the IUCN World Conservation Congress to be held in Hawaiʻi in September. Nabhan is an internationally-celebrated nature writer, seed saver, ethnobotanist and sustainable agriculture activist who is considered a pioneer of the “local food movement.” His studies of indigenous farming, wild-food gathering, and land management focus on preserving ancient cultural traditions and conserving the links between biodiversity and cultural diversity. Nabhan’s work offers important insights into the relationship between culture and land, especially with respect to the constraints of limited, natural resources that all societies eventually face. Tickets are $25 per person (with a $10 student rate available with student I.D.) and are available at the Maui Arts & Cultural Center’s Box Office, by calling (808)-242-SHOW or by purchasing online. All ticket sales benefit local non-profit The Merwin Conservancy. Nabhan is the Kellogg Chair in Southwest Borderlands Food and Water Security at the University of Arizona, where he is also a research social scientist. He is the author or editor of more than 26 books. He is the recipient of a Lifetime Achievement Award from the Society for Conservation Biology. Nabhan’s lecture from 7:30 to 9 p.m. “will highlight the fundamental role ethnobiologists have played in conservation collaborations with indigenous communities, farmers, and chefs to revive and adapt traditional place-based foods,” according to the arboretum’s website. Cost: $10 for members, $20 for others. A MacArthur Fellow and recipient of a Lifetime Achievement Award from the Society for Conservation Biology, Gary Paul Nabhan will be discussing human interactions with plants, animals and habitats in the face of climate change. Dr. Nabhan is the Kellogg Chair in Southwest Borderlands Food and Water Security at the University of Arizona, where he is also a research social scientist at the Southwest Center. He is the author and editor of more than 26 books, including most recently Ethnobiology for the Future. Gary Paul Nabhan, internationally recognized nature writer, agrarian activist, and ethnobiologist who works on conserving the links between biodiversity and cultural diversity, will present a public lecture on the occasion of his latest book release, "Ethnobiology for the Future". Book signings will take place one half hour before and after the lecture. Event is sponsored by a minigrant from the South Carolina Humanities Council with support from the USC Dept. of Anthropology, English Language and Literature, Geography, Health Promotion Education and Behavior, School of Earth, Ocean, & Environment, Jarrett's Jungle, Slow Food Columbia, and SC Garden-Based Learning Network. Dr. Gary Paul Nabhan, the W.K. Kellogg Endowed Chair in Southwest Borderlands Food and Water Security at the University of Arizona, will speak on Thursday, Oct. 20, on “Food, Genes and Culture: Why Silver Bullet Diets and Quick Genetic Fixes Won’t Reduce the Prevalence of Nutrition-Related Diseases.” Nabhan’s presentation is the second installment in the Milliken Lecture Series on Sustainability and Public Health. The program, set for 7 p.m. in the Olin Teaching Theater in the Franklin W. Olin Building, is free and open to the public. Following the lecture in the lobby of the Olin Building, Nabhan will sign copies of his book “Ethnobiology for the Future.” He will donate proceeds from the sale of the book to the Society of Ethnobiology. Nabhan is a MacArthur Fellow, the recipient of a Lifetime Achievement Award from the Society for Conservation Biology, and the 2016 Distinguished Ethnobiologist of the Society of Ethnobiology. He is a research social scientist at the Southwest Center at the University of Arizona. He is an internationally celebrated nature writer, agrarian activist and ethnobiologist who works on conserving the links between biodiversity and cultural diversity. Please join Gary for Conservation you can taste: Collaborative preservation of endangered heirloom foods. Featuring an evening of learning, entertainment, and local food; Joined by Appalachian Institute for Mountain Studies founder Dr. James Veteto. Gary will be discussing the future and the importance of safeguarding if not reversing the cultural and biological erosion facing communities in this day and age. Appalachian State University, in partnership with Blue Ridge Women in Agriculture, will present Sustainable Food Week Oct. 24-29. The campus community and the public are invited to participate in both on- and off-campus events throughout the week, beginning with Dr. Gary Paul Nabhan’s public keynote, “Conservation You Can Taste,” on Oct. 24 at 5:30 p.m. in Room 114 Belk Library and Information Commons. Sustainable Food Week is designed to bring attention to the problems within the food system, as well as to highlight solutions. Nabhan is an internationally celebrated nature writer, agrarian activist and ethnobiologist whose work focuses on conserving the links between biodiversity and cultural diversity. He has been honored as a pioneer and creative force in the local food movement and seed-saving community by Utne Reader, Mother Earth News, New York Times, Bioneers and Time magazine. He is the W.K. Kellogg Endowed Chair in Sustainable Food Systems at the University of Arizona Southwest Center and also serves as founding director of the Center for Regional Food Systems. “We have the great honor to bring Dr. Nabhan to campus to talk about strategies to revive and adapt place-based foods,” said Ignatova. Additional presenters include seed-saving expert Holly Whitesides of Against the Grain Farm in Zionville, Carol Coulter of Blue Ridge Women in Agriculture and other local sustainable food specialists. A plant walk in the university’s nature reserve is also offered. Advance registration for the walk is required and admission is $10 per person. Sustainable Food Week is sponsored by AppalFRESH (Appalachian Food Research for Equity, Sustainability, and Health) Collaborative, Blue Ridge Women in Agriculture, the Office of Sustainability, the Goodnight Family Department of Sustainable Development, the Department of Anthropology, RIEEE (Research Institute for Environment, Energy, and Economics) and the Sustainable Development Student Alliance. Advance registration is required for some events. To learn more and view a full event schedule, visit http://foodsummit.brwia.org. Nabhan is a scholar of conservation and environmental themes, particularly with respect to food. He is a prolific writer, having authored or co-authored 28 books on diverse topics, many for popular audiences. He currently is the W.K. Kellogg Endowed Chair in Sustainable Food Systems at the University of Arizona’s Southwest Center. Nabhan is also a professed member of the Order of Ecumenical Franciscans, and much of his environmental activism and work for food justice have involved the Franciscan Action Network and other grassroots, interfaith initiatives. The focus of the lecture will be a June 2016 cover story of the journal BioScience, which explored the emergent properties and creative tensions among “three sciences” in documenting and protecting landscape-level biodiversity in culturally influenced terrestrial and marine habitats. His talk will highlight 20 years of success in community-based projects with the Seri or Comcaac community in the Sea of Cortez region of Mexico. Each year the Willson Center joins the Environmental Ethics Certificate Program to co-sponsor the Environmental Ethics Lecture, which honors the renowned UGA ecologist Eugene P. Odum (1913-2002), a UGA instructor from 1940 until his retirement in 1984. He has been called the “father of modern ecology” and was the author of the pioneering book Fundamentals of Ecology. Odum was instrumental in the creation of the Institute of Ecology at UGA, the Savannah River Ecology, and the Sapelo Island Marine Science Institute. The Odum Environmental Ethics Lecture is hosted by Dorinda G. Dallmeyer, director of the EECP. In addition to the Willson Center and the EECP, this year’s lecture is co-sponsored by the UGA department of anthropology and the Center for Integrative Conservation Research. The lecture is free and open to the public. 5:00 pmEmory University, Atlanta, GA.
Join us for a special lecture by internationally-celebrated nature writer, agricultural ecologist, ethnobotanist, and proponent of conserving the links between biodiversity and cultural diversity. This lecture will provide insights into the widely-publicized diabetes epidemic among the Pima Indians and other indigenous cultures. It will explore why the HIH/HIS 30 year focus on finding “the thrifty gene” among the Pima failed the reduce the incidence and prevalence of Type 2 diabetes in their communities, and how current integrated “one health”/”culinary medicine” approaches involving native foods and traditional exercise revivals are faring. It will use case studies from Nabhan’s Island Press book Food, Genes and Culture, (formerly Why Some Like It Hot), along with NSF-funded technical research published in the Journal of Clinical Nutrition, Ecology of Food and Nutrition, and elsewhere. Gary Paul Nabhan is an internationally-celebrated nature writer, agricultural ecologist, ethnobotanist, and proponent of conserving the links between biodiversity and cultural diversity. He holds the Kellogg Chair in Sustainable Food Systems at the University of Arizona and works with students, faculty and non-profits to build a more just, nutritious, and climate-resilient foodshed spanning the U.S./Mexico border. Professor Nabhan was among the earliest researchers to promote the use of native foods in preventing diabetes, and he has been honored as a pioneer and creative force in the “local food movement” and seed saving community by New York Times, Bioneers, Utne Reader, Mother Earth News, and Time magazine. As an Arab-American essayist and poet, Professor Nahban is author or editor of twenty-four books and has played key roles in establishing the Ironwood Forest National Monument, community-based seed banks, land reserves for conserving wild crop relatives, and restored habitats for migratory pollinators throughout the West. Agricultural historian Peter Hatch of Monticello has called Nabhan “the lyrical scholar of genetic diversity.” He is also personally engaged as an orchard-keeper, wild foods forager, and pollinator habitat restorationist working from his small farm in Patagonia, Arizona. He has been honored with a MacArthur “genius” award, a Lannan Literary Fellowship, and the John Burroughs Medal for nature writing. He is also an ecumenical Franciscan brother. Gary Nabhan will be given a lifetime achievement award. Gary Nabhan and the University of Arizona will cosponsor the meeting, and facilitate panels as well as present a reading. 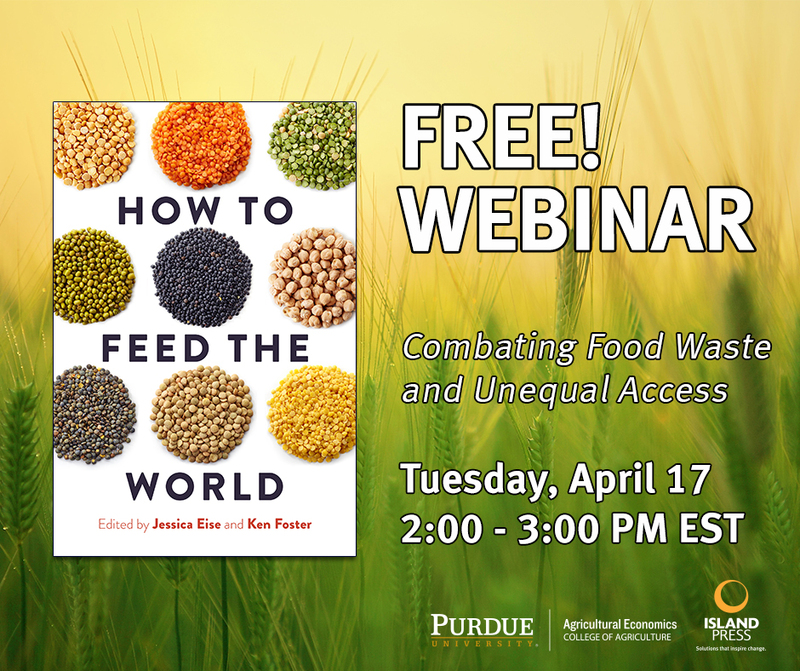 Moderated by Jessica Eise, co-editor of How to Feed the World, this webinar describes methods of achieving global food security, and illustrates the connection between developing equal access to food and reducing waste and loss in our food systems. The webinar features contributors Dr. Ken Foster and Dr. Jerry Shively of Purdue University’s Department of Agricultural Economics, and will include an audience question and answer session. Agave Heritage Festival is a city-wide, ten-day destination event that spotlights the sustainability of the southwest region through the lens of the agave plant. Agave Heritage Festival celebrates the unique importance of the agave plant and the borderlands culture with seminars, trade shows, and world-class culinary events. If you want to remember how people had fun and interacted for the common good of their peoples & landscapes before some among us believed that walls and wars were the ticket, check out the extraordinary list of talent voluntarily collaborating in this year’s Tucson Agave Heritage Festival April 27-May 6. Gary Nabhan will receive lifetime achievement award from the Society for Economic Botany. Tracing the agricultural and culinary traditions that diffused into the border region via Moriscos and Conversos / Ladinos. Join us at Natural History Institute for the Prescott book launch of Gary Nabhan's Mesquite: An Arboreal Love Affair (September 14, 2018 release). Gary Paul Nabhan is an internationally-celebrated nature writer, agrarian activist and ethnobiologist who works on conserving the links between biodiversity and cultural diversity. In his latest book, Mesquite, Gary Paul Nabhan employs humor and contemplative reflection to convince readers that they have never really glimpsed the essence of what he calls “arboreality.” As a Franciscan brother and ethnobotanist who has often mixed mirth with earth, laughter with landscape, food with frolic, Nabhan now takes on a large, many-branched question: What does it means to be a tree, or, accordingly, to be in a deep and intimate relationship with one? To answer this question, Nabhan does not disappear into a forest but exposes himself to some of the most austere hyper-arid terrain on the planet—the Sonoran and Chihuahuan deserts along the US/Mexico border—where even the most ancient perennial plants are not tall and thin, but stunted and squat. There, in desert regions that cover more than a third of our continent, mesquite trees have become the staff of life, not just for indigenous cultures, but for myriad creatures, many of which respond to these “nurse plants” in wildly intelligent and symbiotic ways. In this landscape, where Nabhan claims that nearly every surviving being either sticks, stinks, stings, or sings, he finds more lives thriving than you could ever shake a stick at. As he weaves his arid yarns, we suddenly realize that our normal view of the world has been turned on its head: where we once saw scarcity, there is abundance; where we once perceived severity, there is whimsy. Desert cultures that we once assumed lived in “food deserts” are secretly savoring a most delicious world. Drawing on his half-century of immersion in desert ethnobotany, ecology, linguistics, agroforestry, and eco-gastronomy, Nabhan opens up for us a hidden world that we had never glimpsed before. Along the way, he explores the sensuous reality surrounding this most useful and generous tree. Mesquite is a book that will delight mystics and foresters, naturalists and foodies. It combines cutting-edge science with a generous sprinkling of humor and folk wisdom, even including traditional recipes for cooking with mesquite. Internationally-celebrated nature writer, agrarian activist, and ethnobiologist Gary Paul Nabhan is famous for celebrating the links between biodiversity and cultural diversity. With his latest book, Food from the Radical Center: Healing Our Land and Communities, Dr. Nabhan demonstrates how our polarized society can be made whole through the grass roots, community-based restoration of food-producing landscapes. The Seed Library of Pima County Public Library will mark the publication of Food from the Radical Center with a presentation by the author, followed by a book sale and signing. Refreshments will be served. Food from the Radical Center breaks fresh ground by bringing together diverse groups of people—ranging from land managers and botanists to indigenous harvesters, to PCPL's Seed Librarians—as they work to restore America's iconic foods and their landscapes. Widely recognized as the father of the local food movement, the award-winning author is the Kellogg Endowed Chair at the University of Arizona's Southwest Center; his many honors include a MacArthur "Genius" award, a Lannan Literary Fellowship, and the John Burroughs Medal for nature writing. Sat. Oct. 6, 5–6 p.m. Author, seed saver, agroecologist & father of the local food movement, Gary Nabhan will talk about the largest grassroots initiative in history that is aimed at bringing back the seeds, breeds, native game & fish, & the beneficial microbes that underpin our land's food-producing capacity. He will talk about rebuilding microbial diversity in our soil and in our guts, & collaboration with lives other than our own. Book signing to follow. To answer this question, Nabhan does not disappear into a forest but exposes himself to some of the most austere hyper-arid terrain on the planet―the Sonoran and Chihuahuan deserts along the US/Mexico border―where even the most ancient perennial plants are not tall and thin, but stunted and squat. ​​​​​​​​​​​​​​​​​​​​​​​​​​​​​​​​​​​​​​​​​​​​​​​​​​​​​​​​​​​​​​​​​​​​​​​​​​​​​​​​​​​​​​​​​​​​​​​​​​​​​​​​​​​​​​​​​​​​​​​​​​​​​​​​​​​​​​​​​​​​​​​​​​​​​​​​​​​​​​​​​​​​​​​​​​​​​​​​​​​​​​​​​​​​​​​​​​​​​​​​​​​​​​​​​​​​​​​​​​​​​​The Food Security Program pursues a holistic approach to the many aspects of food security, including nutritional health, agricultural production, economic development, environmental sustainability, and sociocultural considerations.